This popular restaurant (or is it a cafe…) has a fantastic atmosphere and makes a nice place to hunker down for a bit of laptop love – as long at it’s not too busy. The Bole Road Lime Tree closed recently, leaving their sister cafe in Kazanchis as the only choice for getting your lime juice fix. 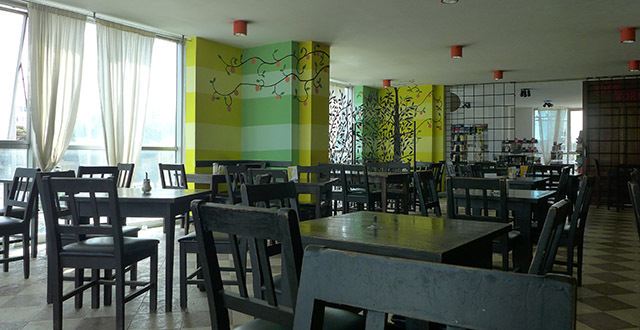 The cafe is located on the bottom floor of a large building just a bit south of the International Continental Hotel. You’ll see the patio with ‘Lime Tree’ written in green circles. Lime Tree has a pretty cozy atmosphere, decent food, friendly service, good coffee, and super delicious lime ginger iced tea. While Lime Tree has the slick appearance of a great spot, the food can sometimes be bit of a let down, depending on what you order. I’ve tried several dishes, some that are quite tasty, some resulting in a resounding ‘meh’, and one being completely inedible. To start with the worst – the ‘Buffalo Chicken Wings’ are nothing at all like legit Buffalo chicken wings. They’re not a regular menu item but if they ever make it to the specials board, they’re best avoided. Why do restaurants the world over insist on using the word ‘Buffalo’ without actually using the correct sauce? People! Honey glaze chicken wings are not Buffalo wings. Sesame chicken wings? Also not Buffalo wings. If there’s ginger involved… yep, also not Buffalo wings. 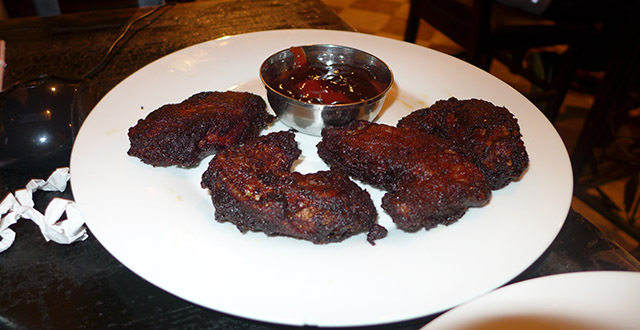 Lime’s Tree’s burnt black chicken wings with a weird ketchup dipping sauce? I’m not certain that’s even food but I know damned well that they’re also not Buffalo wings! The most interesting part of this whole experience is that the waiter insisted that the black char on the outside was the sauce. So… I don’t know what’s going on with those things. I’d recommend you steer very clear of that scariness. 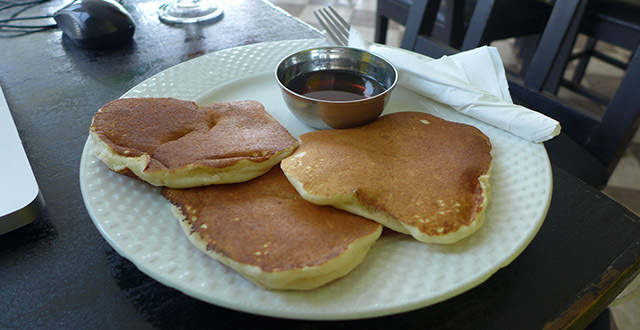 While the mains have been somewhat questionanable, the breakfast has impressed – well, at least the pancakes (50 birr) have . All light and fluffy and with that ‘pancake syrup’ sugary goodness that I love. 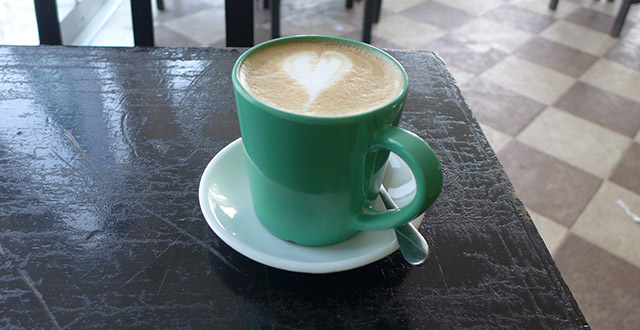 Add a very creamy, tasty macchiato (15 birr) into the breakfast mix and I’m a happy customer. The chocolate cake I tried, on the other hand, let me down in the dessert department… I can’t explain it except to say it was weird. The icing was odd. The cake was… odd. Something just not quite right that I can’t put my finger on. It looked a lot better than it tasted and that’s a sad, sad, thing, my friends. I like the breezy atmosphere of the place. There’s plenty of space and you could easily combine tables if you happen to arrive as part of a group. I have yet to find a plug socket that works but I suppose that’s their way of quietly encouraging the laptop people to depart. But the Kazanchis branch doesn’t have wifi anyway (or at least it didn’t while I was there) so they’re unlikely to have too many people sticking around to milk them for internet. Service is pretty good when you can get their attention. They don’t really check up on your table so you have to flag them down if you want anything but that’s ok… I’d rather have an inattentive waiter than someone who hovers over me, although that might be a weird personal preference. One time the waiter forgot to put my tea and lime juice on the bill and then gave me the total without giving me an updated bill… since I ordered the tea about 4 minutes before receiving the bill, and since there are signs all over the place requesting customers not to pay unless they get a bill (which I only noticed later), I’m assuming this is a bit of shady behaviour on the part of the waiter. Of course… it could be an honest mistake and it doesn’t really effect me anyway… but I’m not one to support shadiness so keep an eye out for this if it bothers you. Overall… Lime Tree’s food is decent but not great. I love their lime juice and ginger lime iced tea (both 30 birr) and it’s worth a trip there just for these. You can even opt for an unlimited supply for 15 birr more. I love their coffee. I like the atmosphere. The servers are friendly. Overall… Lime Tree is a well-located spot to get a decent meal and some tasty drinks and it’s worth totally worth a stop. A Canadian who left in 2001 to wander around the world in search of sun, beautiful views and goat brochettes. Found Kigali, Rwanda in July 2010 and has been there ever since. After starting a successful website there (http://www.livinginkigali.com) decided to explore Addis and create one for this great city as well. We love Limetree, especially the brunch on Sunday mornings.